There is a brand new amigurumi book being released this week, and it is jam-packed full of 25 absolutely adorable designs! Lauren Espy, the amigurumi designer known as “A Menagerie of Stitches” has published her first book entitled “Whimsical Stitches” in collaboration with Paige Tate & Co. Publishing. 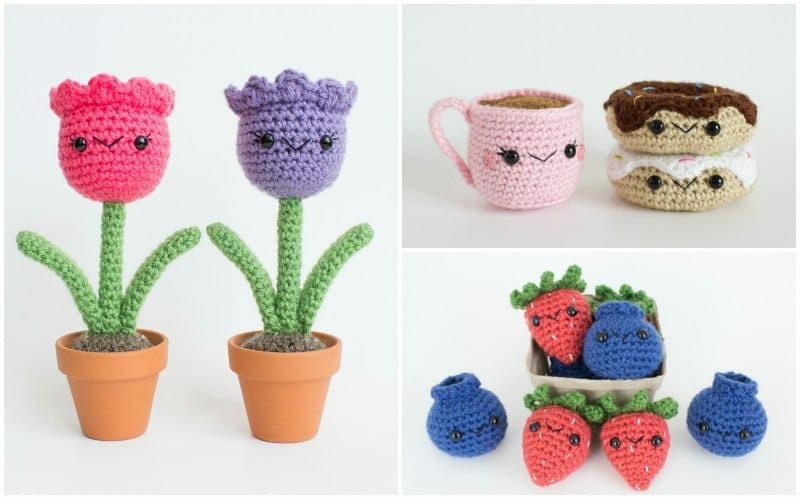 The tagline of the book is “A Modern Makers Book of Amigurumi Crochet Patterns“, and Lauren’s book is full of smiling food, plants, and animals. Lauren’s crochet journey began in 2009 when her grandmother bought her a book about amigurumi and also gifted her with a full set of crochet hooks. Lauren fell in love with this artform and eventually began designing her own patterns. Her Chemistry Set went viral a few years ago HERE, and she is thrilled to present more adorable designs in her new book! Whimsical Stitches is divided into five sections: In the Garden (Saguara Cactus, Succulent Planter, Sunflower, Tulip), At the Aquarium (Jellyfish, Octopus, Turtle, Whale), Down on the Farm (Bunny, Cow, Duck, Eggs, Pig), At the Bakery (Cookies, Cupcakes, Macarons, Mug & Donut, Pie) and At the Market (Bell Pepper, Berries, Eggplant, Onion, Peach, Pineapple, Tomato). In addition to the patterns, the book also contains information about Materials and Tools, Abbreviations, and Stitches & Techniques. Whimsical Stitches is such a bright and colourful book, and it is great for beginners who are interested in diving into amigurumi! There is a wide range of projects, and chances are you will find a design that piques your interest. 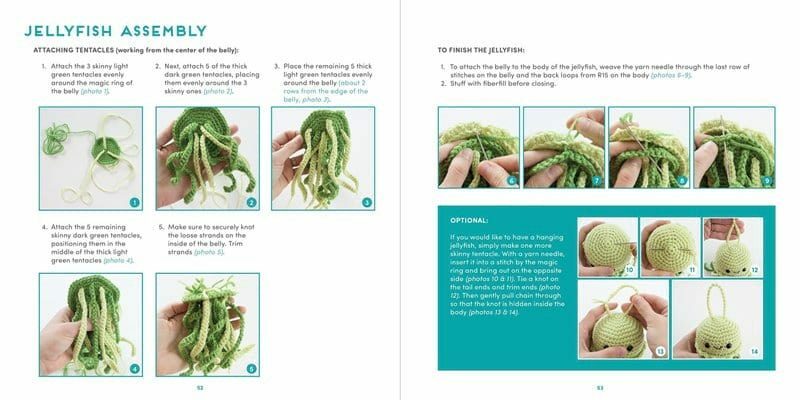 Lauren’s instructions are very clear with plenty of step-by-step pictures to accompany each pattern, such as the jellyfish assembly as shown below. I myself wanted to try crocheting the adorable Cherry Pie with Mini Cherry! Crocheting amigurumi is so much fun since you can whip them up quickly, especially compared to a garment or blanket. Here is the adorable cherry pie with its sweet rosy cheeks! I love how you can make an accompanying little cherry to sit atop the pie as well- here is our cheery cherry with its green stem! Inanimate objects really come to life and are personified when you add smiling faces and adorable expressions to them! Don’t these two look so sweet together? I enjoyed working through Lauren’s pattern to create this adorable set, and I know many others will enjoy bringing Lauren’s designs to life! You can check out the new “Whimsical Stitches” book HERE! The book itself is beautiful, and I love how it feels like such a high quality book with the sturdy hard cover You will enjoy browsing through the pages as you choose which design to work through first, and all the cute creatures are sure to bring a smile to your face! Lauren, Paige Tate & Co Publishing, and I are partnering together for a generous GIVEAWAY [NOW CLOSED]! THREE WINNERS will each receive a hard copy of the book! ***To enter, please leave a comment below stating what amigurumi you are most excited to crochet from Whimsical Stitches (e.g. succulent planter, macarons, tomato, etc)! This giveaway is open WORLDWIDE and will close on Sunday, June 17 at 8 PM MST! You can also enter through Instagram and Facebook for more chances as we will be choosing one winner from each platform! 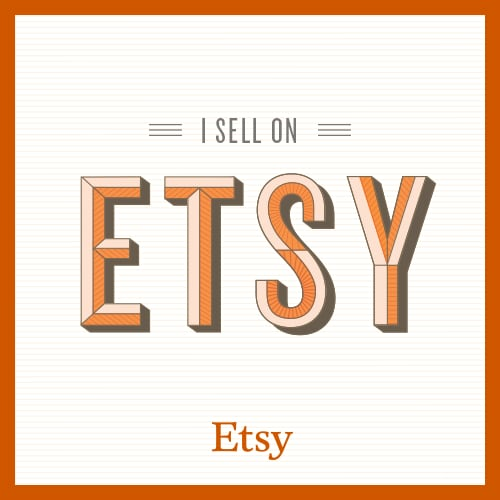 Follow along with Lauren’s work on her Instagram HERE and through her Etsy shop HERE! You can also read more about Lauren’s crochet journey and how this book came to be in Lauren’s blog post HERE entitled “How One Little Hobby Can Turn Into A Dream” on The Hook Nook Blog! Congratulations on this huge accomplishment and milestone, Lauren! Note: I was provided a copy of “Whimsical Stitches” for review! All opinions expressed are 100% my own! See the wide range of kits we have designed in partnership with Lion Brand Yarn! 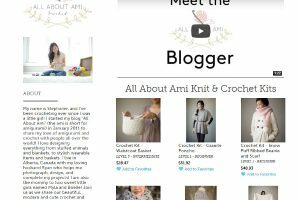 Check out the "All About Ami" page on the Lion Brand website!